There are good things and bad things about A Place For Us by Fatima Farheen Mirza. Let’s start with the good. A Place For Us is the story of an Indian-American family living in California. Parents Rafiq and Layla have three kids: daughters Hadia and Huda and son Amar. The book revolves around Amar, who grew up struggling with his parents’ Muslim traditions and their expectations for him. When the book opens, Hadia is getting married and Amar has shown up to the wedding, the first time he has seen his family in three years. Through flashbacks, Mirza pieces together Amar’s childhood and adolescence, including the tension he experienced in his relationship with his father, his secret, forbidden love for the daughter of his parents’ friends, and his struggle to live up to the high standards set by his sisters. At the wedding, Amar reconnects with his mother and sisters, as well as the woman he loved as a boy, but the pressure of the situation causes him to drink and confront his mother, ultimately driving him away from the family again. 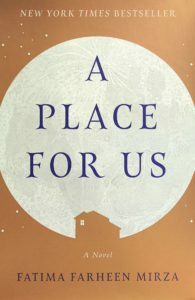 A Place For Us is a heartbreaking exploration of the relationships and history leading up to the wedding and the many, often subtle, ways that Amar’s family failed him. There is a lot of pain in A Place For Us, with characters acting from a position of love but not being able to communicate or compromise enough to truly connect with each other. The final section, which is told from Rafiq’s perspective, is the most powerful in the book. These two men were so close to reconciliation and understanding, yet due to stubbornness and pride, they never achieved it. If you like novels about culture clash and the complexity of families, then A Place For Us is a book for you. But I have to warn you: A Place For Us is an unnecessarily long and slow book. It took me forever to read it. The reading is dense and detailed and beautiful, but it’s also quite repetitive. I think the author took many years to write it, and it shows. It could have been pared down considerably without shortchanging the flashbacks or compromising the complexity of the relationships. So while I really loved this story and recommend the book, it’s with the huge caveat that it’s really, really slow.